One outcome of the 2012 elections was the defeat of Proposal 37 in California, a proposal that sought to require that food sold in the state included labeling, particularly if there were any GMOs – Genetically Modified Organisms. It was an issue that generated a ton of money, particularly from the corporate forces in opposition to complete transparency about what is in the food that people are eating. The most recent data shows that groups wanting food labeling in California raised a few million dollars, compared to the nearly $50 million raised by food corporations opposed to telling people what they are really eating. Coca-Cola might not want to label the genetically engineered corn used to make the high fructose corn syrup in its sodas, but it also owns organic and “natural” brands like Honest Tea and Odwalla. Likewise, PepsiCo, owner of Izze and Naked Juice, donated $1.7 million to oppose Prop 37 – more than every other donor except Monsanto and DuPont, and even more than the other four major biotech corporations (Bayer, BASF, Dow, and Syngenta). 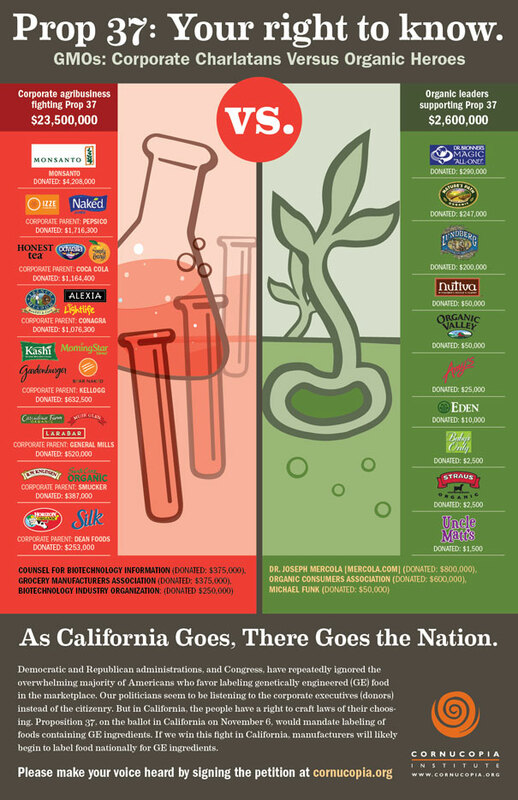 Other brands owned by Prop 37-opposing corporations include Lightlife and Alexia (owned by Conagra); Kashi, Gardenburger, Bear Naked, and Morningstar Farms (Kellogg); Cascadian Farm Organic, Muir Glen and Larabar (General Mills); R.W. Knudsen Farms and Santa Cruz Organic (Smucker); and Silk and Horizon Organic (Dean Foods). Looking at the list of corporations named, one can see that there are two based in Michigan – Dow and Kellogg. Monsanto was by far that largest contributor to the defeat of Prop 37, but Dow contributed $2 million and Kellogg chipped in $790,700. This is just one more example of how companies like Dow and Kellogg, despite all their claims to be environmentally and socially responsible companies are simply committed to making a profit. 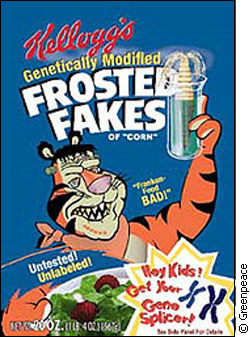 The defeat of the public’s right to know what it is eating is just one more reason to not financially support companies like Kellogg, Dow and Coca Coal by boycotting them. However, boycotting these companies is not enough, they must be confronted by a resistance movement that can put them out of business since they continue to demonstrate that they do not care about the public well being.